With the announcement of Budget 2014, it becomes clearer the government’s hypocrisy. In Budget 2014, the government had once again said that, they can “only sustain wage increases if we succeed in boosting productivity” and that, “if we try to push wages up, we will end up with either higher consumer prices or squeezed profit margins that hurt both businesses and ultimately jobs”. It was also said that this would, “become a zero-sum game between business profits and wages, that no one benefits from”. In fact, in the government’s mouthpiece, The Straits Times, it’s not uncommonly heard that wage increases for the low-income workers have to be put off because, “many firms are worried that it may increase their costs“. Which is why it was inconsistent when the government would once against raise the foreign worker levies and CPF contribution rates, even as it would add to the costs as well. Nominated Member of Parliament Tan Su Shan had said that, “The one per cent CPF increase in employer contribution will increase the burden of SMEs in the short term,” and that, “it is going to affect overall costs for SMEs”. Which is why it is perplexing why the government went ahead to increase the foreign worker levies for the construction industry and CPF contribution rates without batting an eyelid. So, hold on a minute there – the government had strenuously resisted implementing a minimum wage because they were afraid that costs would escalate, yet when businesses give the same reason for being worried about increased levies and CPF contribution rates – that it would increase costs, the government went ahead to increase them anyway – not just once, but for several consecutive years! Yet, over these past few years, no matter how hard-wrought the battle is to advocate for a minimum wage, the government refuses to do so. Thus the first hypocrisy of the government exposed – “costs” is just an excuse thrown around by the government, to be used as and when it suits their needs. You see, there is little incentive for the government to increase wages because any increases goes direct to our pockets and our savings – why would they want that? It doesn’t benefit them or increase their coffers. However, when they increase the CPF contribution rates, it goes direct into their coffers, which they can then use for investment. But isn’t the CPF “our money”, you ask? Not really, not when the CPF has already accumulated $253 billion last year and Singaporeans were only able to withdraw $15 billion, or just 5.9% of the whole balance – if indeed the CPF is “our money”, why is there such a massive balance – in the billions! – inside the CPF, and why is it that is has been estimated by Leong Sze Hian that 1 in 8 Singaporeans are not able to meet the CPF Minimum Sum? It’s quite funny, isn’t it, that there is so much “retirement funds” inside the CPF but Singaporeans cannot actually save enough in their CPF to be able to retire. If there is so much of our money that we have saved inside, how come we still cannot save? How has the government created ways to prevent Singaporeans from taking their CPF out, but siphoned it off to be locked up inside? Thus clearly, “costs” isn’t the issue – what matters in this decision making – whether to increase wages or levies/CPF contribution rates – is whether the government (and the companies that they own through the investment firms and connections) makes money out of it. Herein lies the next hypocrisy. The government claims that they have increased the CPF contribution rates “to increase the retirement savings of workers” and “to better provide for the future medical needs of Singaporeans”. However, as discussed, when the CPF is trapped inside, how does raising the CPF contribution rates help to increase your retirement savings? It does not. Not only that, as I had previously written about, not only does your CPF gets trapped inside, so does your Medisave – your Medisave has already accumulated at least $60 billion in balance, yet only $768 million, or 1.3% was withdrawn in 2012. What happened to the other more 98.7%? It gets trapped inside. As being said by Singaporeans nowadays, the CPF is supposed to be our retirement fund – however, why is it that they have put in so many rules in place that has caused us not to be able to take our monies out? Next, why did they make us pay for Medisave for healthcare from our retirement funds, when we already cannot save enough to retire with? Yet, they have made us accumulated vast balances – $60 billion in Medisave and a total of $253 billion in CPF – and yet would give us only a puny 1.3% from Medisave and 5.9% from CPF out. Where is our money? 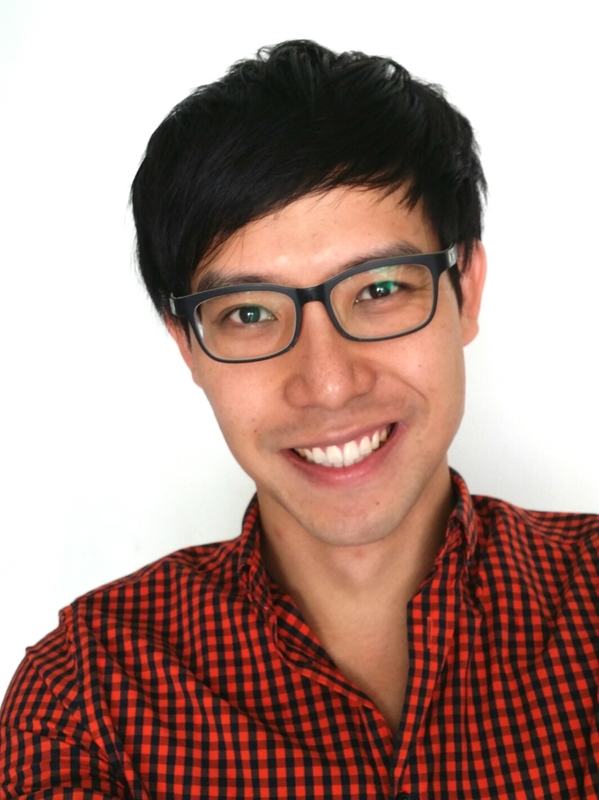 This is the hypocrisy – if the government is truly concerned that Singaporeans would be able to “increase our retirement savings” and “provide for our future healthcare needs”, then the government would do what Prof Lim Chong Yah had recommended – to increase CPF pay-outs to low-wage workers. Also, it is already common knowledge now that our CPF is being used to invest in the GIC and Temasek Holdings, which are earning 6.5% and 16% in interests, but Singaporeans only receive 2.5% to 4% on our CPF. This means that the interest earned that is not returned to Singaporeans is known as an “implicit tax” that Singaporeans pay to the government. 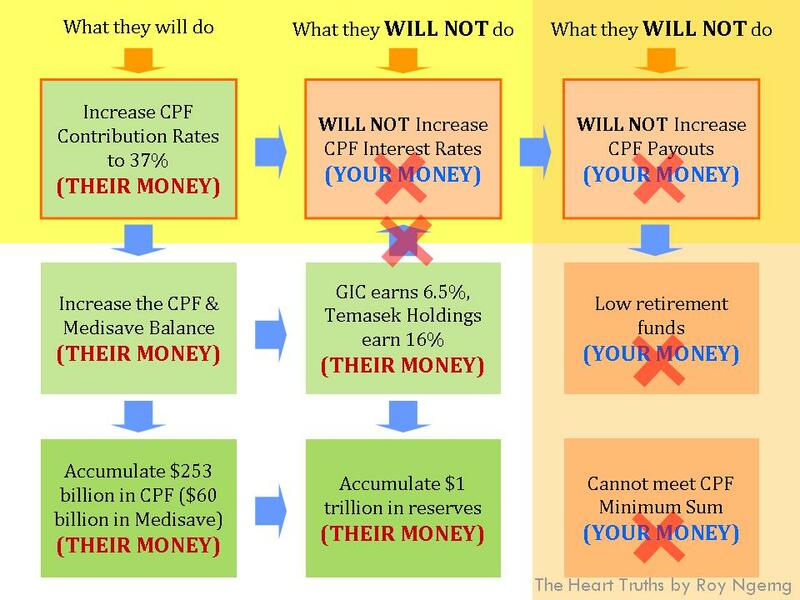 So, if the government is truly sincere, they would increase the CPF and Medisave payouts and increase the interest on our CPF and Medisave by returning the interest earned back to us. You see, the whole point for them to want to increase the CPF and Medisave contribution rates was to increase the coffers for their own spending. Increasing the payouts and interest rates would deplete what they deem as their coffers. Which is quite weird, isn’t it – the CPF and Medisave is your money – what right do they have and who gave them the authority to see the CPF and Medisave as their money, and what right do they have to change the rules to suit their monetary needs? Then if the government cares only about their own financial needs, then who would care for the needs of Singaporeans? No one? Is that why only 1 in 8 Singaporeans – or 13% of the richest Singaporeans – are able to meet their CPF Minimum Sum, while the rest of us are forced to have to keep working and never be able to retire, because our retirement fund cannot do what it was set up by the British in 1955 to do – to provide adequate retirement? Now, mind you, the CPF that we have contributed have helped to accumulate a reserves of $1 trillion. Yet, the CPF that Singaporeans have been forced to part with has also created a poverty rate of 26% amongst us – from only 16% in 2002. You do the maths – increasing CPF balance and reserves but more Singaporeans who are living in poverty and more people who cannot retire. Something wrong with their claim of wanting Singaporeans to “increase their retirement savings”, isn’t it? (3) Highest Wage Growth On Zero And Negative Productivity Growth? Finally, on the oft-mentioned we can “only sustain wage increases if we succeed in boosting productivity” again, the irony lies in the fact that it was reported in Channel NewsAsia that, “Singapore’s labour productivity registered zero growth for 2013”. And not only that, the Ministry of Trade and Industry had even said that, “this is an improvement over the negative growth of minus two per cent seen in the year before” and that, “last year’s (zero) growth is the first improvement in three years”. Yet, it was also announced that, “median wages have increased by about 9% in real terms in the five years to 2013” and “significantly better than in the other Asian Newly Industrialised Economies”. Leong Sze Hian has also already dispelled the notion that our real wages had actually increased so dramatically and that real wages over the last 13 years had actually declined. But nevermind that – wait a minute – if the government would so claim that wages can only be increased if productivity increases, then how is it that in spite of the negative and zero growth, wages actually grew? So what is amiss here? Either the government is bluffing about having to tie wages to productivity or wages didn’t really grow, but they were made to look like they have grown. Of course, some people are guessing that the wage statistics were fudged and that any increases are just a statistical manipulation, with no real effects for Singaporeans. As someone had told me before, “Huh, the median wage has increased to more than $3,000? I don’t even get $2,500 even though I have a degree.” Fudged or not, I am not sure since there is no way we can verify but if it did happened, I wouldn’t be surprised, seeing what they had done to the Gini coefficient figures and how they had pushed down the figures for the same year in different later reports. So, something’s not quite right here. Did wages actually increase or did they not? Were wages statistically manipulated to give the perception that Singaporeans are paid more, to pacify Singaporeans – when in actual fact, there were no real effects? Or was there such a large pool of workers who are paid low wages anyway that any real increases in productivity cannot be seen at all? More importantly, here is the truth about wage increases. 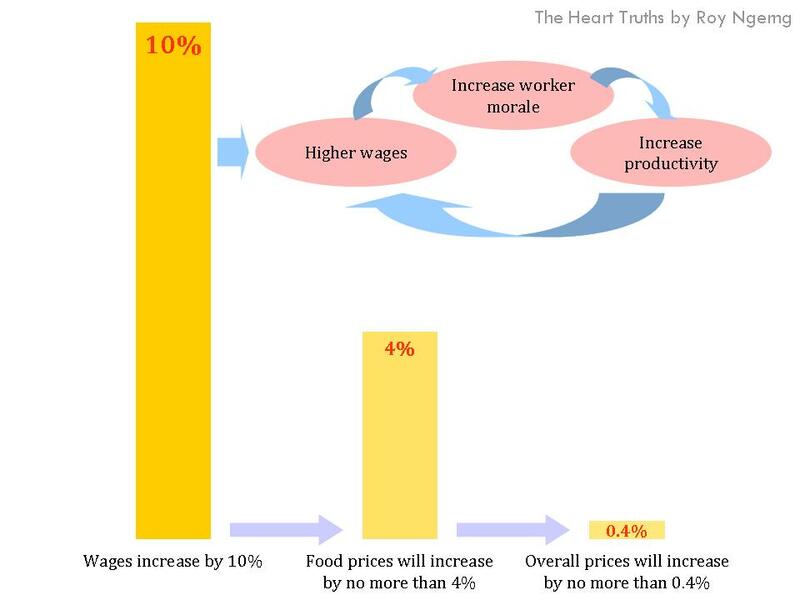 It was found that, “a 10% increase in the minimum wage would increase food prices by no more than 4% and overall prices by no more than 0.4%“. In fact, it has also been said by Dr Tan Meng Wah from the Lee Kuan Yew School of Public Policy that, there is a “limit in linking productivity to wage increases is that the concept of productivity tends to undervalue the efforts of low-wage workers while overvaluing those of the top executives“. Not only that, instead of waiting for productivity to grow before paying higher wages, by paying higher wages first instead, it was said that this which would induce workers “to work harder … (and be) more productive so as to keep their jobs“. It has been 4 years since this article was written and yet the government refuses to implement minimum wage. Yet, they continue to advocate for a Progressive Wage Model for cleaners where the lowest basic wage is only $1,000. Would the PAP ministers be willing to live on a wage of $1,000 every month, down from their million-dollar salary? As the government continues to announce more half-baked measures to “improve” the lives of Singaporeans and as they continue to find ways to earn from Singaporeans, it becomes more and more clear their hypocrisy. 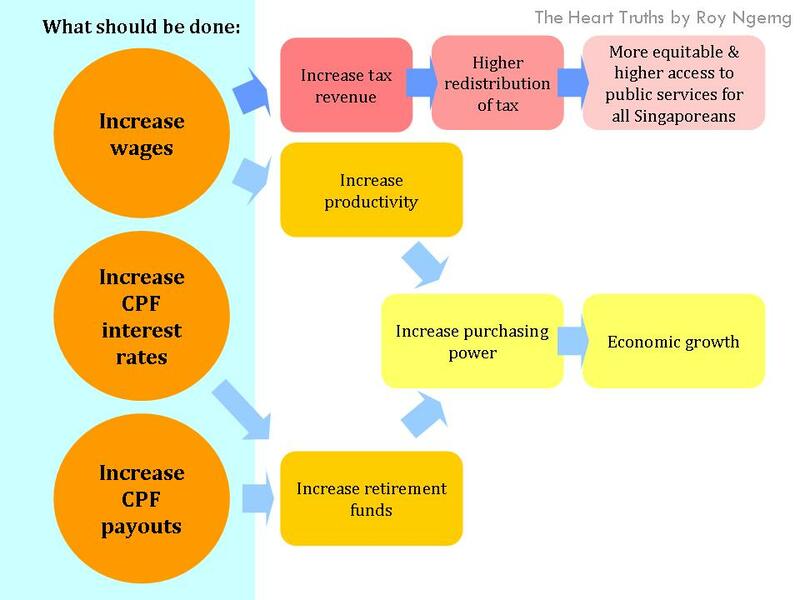 The easy solution to better the lives of Singaporeans is to increase our wages and to redistribute the taxes that we pay back to us. Yet, the government has refused to increase our wages (of low- and middle-income Singaporeans) and has returned much lesser of our tax back to us, than what it should. 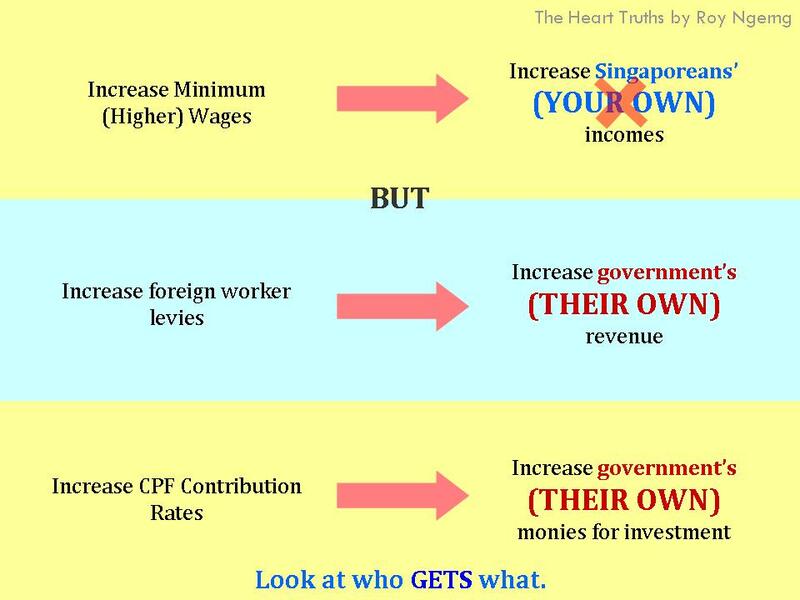 However, in its place, the government would rather increase foreign worker levies and the CPF and Medisave contribution rates – they claim that these measures would aid in increasing the wages of Singaporeans, but in reality, they will not. Meanwhile, the foreign worker levies would have accumulated $3 billion by now. If this is channelled back to low wage workers in Singapore, all of them would be able to receive an additional $4,000 every year. Wouldn’t this be more useful? I do not know about you but the hypocrisy is becoming increasingly blatant for anyone to turn a blind eye to. It is simply not right for a government which is one of the richest in the world to pay themselves so well, while treating its citizens like dirt by paying such low wages, yet whilst trying to whitewash them by telling them that their lives are getting better, that they are being paid better, when you can just ask a low-income person, and they would try to put up a brave front, but from beneath the wrinkles on their hardened faces, you can see that some of us have never even worked as hard as they have, but what have they done to deserve such mistreatment by their government? Just simply because they were not born rich and did not have the right connections to the top few? I don’t know if this is the kind of society that I want to be in, which claims meritocracy as a guiding principle but the underhanded methods to get to where they want are actually getting more and more blatant, where the whole “to build a democratic society based on justice and equality” is now a lost vision that has now gone down the drain, as everyone is forced to bite at each other just to survive. No, this is not the kind of society that I want to live in. And I think we can change this. Is this true? 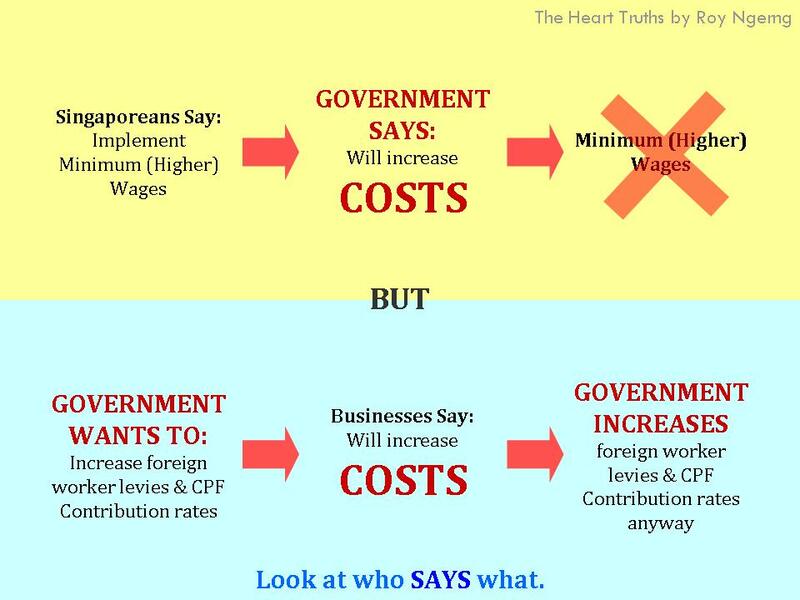 From I understand, this statement should be corrected to “Some Singaporeans say Minimum wages”. 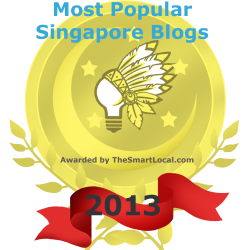 From the forum letters, it appear that Singaporeans have different views of this issue. From what i understand at least, this statement should be true. “Most Singaporeans say CPF contribution rates should go up”. And the government has done that. Are you saying that Singaporeans in general do not wish for CPF contribution rates to go up before it will supposedly increase the government’s coffers? Most Singaporeans say CPF contribution rates should go up? Really? You make me laugh. Most Singaporeans want to see their wages go up. Do you hear people call for higher social security contributions in other countries, or do you hear the collective call of the world to ask for higher wages? Please. Logic, please. And I’m not saying that CPF contribution rates will increase the government’s coffers. I’m pointing out that it already is. Reality. Reality, please. Just use your eyes. It’s a given fact that if all things remain equal, most people will want their wages to go up. Have you ever hear anyone saying that they are paid too much? Ok. I should have made it clearer. Most Singaporeans say the employers share of the CPF contribution rates should go up – not the employee share. The difference between our system and people in US/Norway is that ours is a defined contribution plan while they are defined benefits. So of course people in these countries will want contribution rates to come down while benefits remain constant. For us, as long as our take-home pay is not affected, the more the employers pay for us into CPF, the more we get in our CPF balance. And that’s mandatory under the law. I’m guessing that your reason is that if there had not been the increase in CPF contribution rate of employers, they would have paid out the proposed increase as wages. So do you think that has happened over the past few years where no increase in CPF was being mandated? Please cut the fuss about the system. It’s not about the system. It’s about the cash flow. OK, let me put it in simple maths if it’s hard for you to understand. Let’s say we look at the same salary for a person in Norway and Singapore, for a very simple argument – both earns $50. In Singapore, the person pays $20 into tax and CPF to the government and gets back $10. It’s pointless and utterly ridiculous when people like you keep bringing up the comparison of the system. Even if the government does get increased revenue from levies and CPF contributions, it’s not like the ministers gets commission based on how much income the government gets. Why speak as though they are trying to steal our money? The money eventually goes to public spending which benefits us or investment to get returns which would also benefit us. Unless you are suggesting that the government is stealing from the people to line their own pockets. Also, there are also steps to increase the wages of the low wage workers in Singapore like the recent increase of the minimum wage of cleaners in Singapore. With all the transfers and things like WIS the low wage workers don’t exactly earn just $1000 a month either. Instead of introducing a blanket minimum wage across all industries and increasing the costs for businesses and indirectly consumers, I think having transfers from the government budget is a better strategy. Not to say that all is good, there are definitely still things to improve on but i don’t think the pap government is doing a bad job. Not perfect, but well enough to be called good governance.